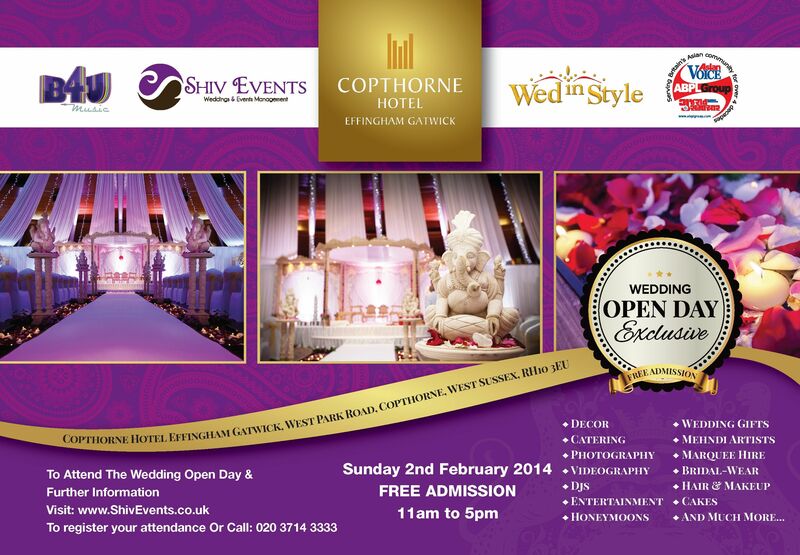 If you are planning your wedding for 2014 or 2015, do not miss out on the FREE Wedding Open Day at Copthorne Effingham Gatwick on Sunday 2nd February 2014 from 11am – 5.00pm. Admission is absolutely free! and there will be a whole host of wedding suppliers from Wedding Decor, Wedding Catering, Wedding Photographers, Wedding Videographers, Wedding DJ’s, Wedding Entertainment, Honeymoon Specialists, Wedding Mehndhi Artists, Wedding Marquee Hire, Asian Bridal Wear, Wedding Hair and Makeup, wedding cakes and much more!